Just like in most European nations, as well as numerous countries around the world, Christmas is among the biggest and most popular holidays in the Czech Republic. Over the centuries, Czech Christmas traditions, customs and ceremonies have developed into somewhat of a cultural phenomenon. Barborky have very little to do with St. Barbara, except for the name. They used to visit rural homes on the eve of St. Barbara’s Day. Their costumes varied according to the individual region – sometimes wearing white dresses tied by a wide blue or red ribbon around their waist with both ends hanging down the left side of their body. So they would not be recognized, their hair was worn over their faces with a flower chain or a crown on their heads. In the right hand they would carry a broom and in the left, a bundle or basket with presents. In some regions they wore a white cloth and tulle veil, or black dresses. What do these mysterious Barborky do? Their arrival was signaled by the thrashing of their brooms on the windows and a ringing bell, after which they would enter the house and proclaim: „We have come from the Chapel of Drazíc to inspect your children, and to see whether they have been good or not this year. St. Nicholas will be arriving soon from far, far away, to bring great gifts to all the children who have been good. The angels have told St. Nicholas where all the good children live and these children will receive precious gifts from him. Now we must leave on to the next house, and if you children are good, we shall see you next year again.“ Good children were never afraid of Barborky. The evening before St. Nicholas Day, December 5, St. Nicholas strolls around the city, accompanied by an Angel and a Devil, visiting children and handing out presents. First, he asks the children whether they have been good and if not, they must promise they will be better next year. In Central Europe, there is no association of this St. Nicholas with the Western character of St. Nicolaus, also known as Santa Claus (like in England, USA, Sweden or elsewhere) who brings presents at Christmas. The St. Nicholas tradition is based on the legend of St. Nicholas, a bishop who lived in the 4th century in Asia Minor and was renowned for his religious life and charity. St. Nicholas gives presents in all Slavic countries. This tradition became very popular and the character of St. Nicholas, dressed in a long coat with a crosier in his hand, is now always accompanied by a devil and an angel, representing the antimony of good and evil. St. Lucille was born to a family of wealthy Christians in Syracuse, Sicily. After her father’s death, her mother arranged for her to be married to a young pagan man. Lucille refused to marry him and in turn, gave her dowry to the poor. When her suitor learned of this, he accused her of being a Christian. The court ordered her to be taken to a brothel, but when they attempted to do so, she stood firmly in one place as if she were a pillar of stone, no one able to move her. In the end, they decided to execute her and had the executioner come and slash her throat with a dagger right where she stood. And so, St. Lucille is worshiped as the patron saint of seamstresses and coachmen. The Czech nation also regards her as a guardian against witches. St. Lucille’s Day, December 13, used to be the winter solstice according to the older Julian calendar – the most significant moment of the entire year. This is where the old Czech saying „Lucille – shortens the night, but will not extend the day.“ comes from. With the new calendar, the winter solstice was moved back eight days, so this saying has little meaning today but it is still quoted often. In addition to Barborky, Lucille and St. Nicholas, other masks can be seen roaming the streets during advent. Ambrose used to lure children with sweets he would scatter about and then chase them around the church with a broom. Ometacka (Sweeper) never spoke, she would just sweep a stove three times with a birch broom and bless it in exchange for a small gift. Perchta (Perechta, Peruchta) was similar to Lucille. She wore a fur coat inside out, rabbit skin on her head, held a wooden knife in one hand and a pail with pea plants in the other. She would scare children by threatening them that she would pierce their tummies and stuff them with the pea plants, if they were too self-indulgent. In some regions these characters would wear a mask with a moving tongue. Another similar character was called Bruna, who looked like a horse. gingerbread cribThe Christmas spirit can be felt from the onset of advent, which starts the first advent Sunday before Christmas Eve. Advent (adventus in Latin) means the „arrival“. This is a time of strict fasting, where no joy, dance or singing is permitted. As can be seen from the name, its origins are purely religious. However, in the past, there were times of caroling with folk masks – a combination of old pagan traditions with the religious ban on having a good time. People were not supposed to eat meat, with the exception of fish. Advent fasting ended with the arrival of the first star on Christmas Eve. The tradition of lighting the four candles on an advent wreath is very common now. With the candle light symbolizing the arrival of Christ. Children now get a chocolate advent calendar which makes it easy for them to count the days until Christmas Eve. During advent, towns put up Christmas trees and shop windows are decorated in traditional themes. The largest Christmas trees in the country can be found in Prague in the Old Town Square and at the Prague Castle, where Christmas carols and songs are sung. Boxes for charity purposes are usually placed under these trees. The historic districts of towns throughout the country host Christmas markets where traditional Christmas items can be found – Christmas decorations: straw, wooden, glass, gingerbread, etc. as well as candles, sparklers, nativity scenes, advent wreaths, ceramics, Christmas cards, toys, sweets, mistletoe, chocolate decorations, traditional Christmas dough decorations, etc. There are also demonstrations of traditional folk crafts – blacksmiths, glassmakers, woodcarvers and makers of holiday decorations. Christmas trees are usually decorated on Christmas Eve, December 24, or earlier in some families. Nativity scenes are arranged, Christmas presents are wrapped and preparations for Christmas dinner are made. The Czech traditional Christmas dinner consists of fish soup, breaded fried carp fillets and potato salad. As the Christmas menu varies from region to region as well as family to family, there are indeed a whole host of recipes used. Tourists can also enjoy the Czech Christmas atmosphere as most of the restaurants and hotels offer traditional Czech Christmas meals. The tradition of decorating Christmas trees is not very old in the Czech Republic. Legend has it that the first Christmas tree in Prague was erected for Christmas in 1812 at the Liben Chateau by the director of the Theater of the Estates J. K. Liebich for his guests. Soon after, the Czech aristocracy and wealthy townspeople followed his lead and in the 1840, the tradition of Christmas tree decorating was wide-spread. In the past, trees were decorated with sweets, various folk ornaments made from wood, ginger bread or dough, although nowadays they have mostly been replaced by blown glass and colorful tinsel. However, traditional ornaments made from natural materials are slowly making their comeback including straw ornaments, apples, nuts and the orange fruit of the Chinese lantern plant. Originally, the Christmas tree was hung tip-down, not standing upright. Nowadays, the trees are taken down on the day of the Magi or the following Sunday. Christmas is a family holiday where no one should stay home alone. That’s why the entire family usually meets at the Christmas dinner table and if someone lives alone, they are invited over by friends or neighbors. The festive dinner is followed by the special moment which children look forward to all year long – unwrapping the presents from under the tree that were left by baby Jesus. To get the presents they wished for, many children write letters to baby Jesus before Christmas. On Christmas Eve, baby Jesus enters each home and leaves presents under the tree. He lights the candles and lights on it and then disappears without being seen just before the Christmas bell rings. Christmas carols are usually sung under the lit Christmas tree. The most famous are: Christ the King is Born (originated in the 15th century), Wanting Him to Fall Asleep (17th century), Merry Feast of Yuletide (late 17th century), Come All Ye Shepherds (from 1847) and Silent Night (originally Austrian from 1818), as well as Czech carols: Pujdem spolu do Betléma (Come Together to Bethlehem), Stojí vrba kosatá, Dej Buh stestí (May God Bless You). At midnight, people usually go to church for J. J. Ryba’s Czech Christmas Mass. Christmas Eve used to be a day of strict fasting in the past, accompanied by a slew of folk traditions from manifold superstitions to poetic customs. Parents promised their children that they would see a golden piglet if they keep the fast. People also believed that there could not be an odd number of people sitting at a Christmas table therefore, they would be sure to invite guests ahead of time. Dinner has always been plentiful with several courses. The old traditional meals included Cerny Kuba (Black Jack or barley and mushroom casserole), pea or lentil soup, fruit, nuts, apples, roasted flat bread. Sometimes people would eat fish but it was not very common, as it was thought to be a meal fit for fasting. Not until the 19th century did carp find its way onto the Czech Christmas table. Christmas Eve according to the popular belief, was an ideal day for performing various folk customs. These fall in three groups: taboos, fortune telling and superstitions concerning fertility and abundance. These were most often connected with St. Lucille’s Day, Christmas Eve, Holy Innocents and The Magi. Some of them manifest a visible connection with worshiping the souls of the dead. The taboo of sweeping on Christmas Eve was based on the belief that sweeping could injure the souls of dead ancestors, whom may take revenge on the perpetrator later. For the same reason the following activities were also considered taboo: lifting fallen objects, painting walls, milling grain, crushing fruit, pouring water on the courtyard, getting up from a table quickly (this has persisted to this day) and throwing ashes away. Work taboos – spinning, winding, weaving, knitting, sewing, threshing – also to prevent injuries to the souls of the dead. The revenge of these souls could manifest itself later by producing a poor crop (flax, hemp or grain). Holy Innocents (December 28): people were not allowed to wash laundry, because the laundresses would then be tired the following year, as would the livestock and in addition, the livestock would limp. Washing laundry was prohibited because it was believed that this washing was done in the blood of murdered innocents and they, in turn, would then be unhappy. Sewing was banned because this would cause children to have their eyes poked and if the lady of the house were to get up before Christmas dinner was finished, the hens would refuse to sit on their eggs. Christmas Eve is abound with multiple taboos – no buying, selling, borrowing, lending, sneezing or sitting across from a door. These taboos were taken seriously, as no one wanted to invite bad luck, disaster, bad crops or the wrath of the spirits. Fortune telling has always intrigued people. A seemingly dead twig when put in water in a warm room, sprouted leaves and bloomed. This twig is called „barborka“, because it should be cut from a fruit tree on St. Barbara’s Day. Sometimes girls would cut more than one, each representing a different boy and the one which would bloom first would symbolize her future fiancé. There were several superstitions concerning marriage – the shaking of a bush or a fence which would reveal the direction the fiancé would be coming from. The girls would say: „I’m shaking this fence, calling on all my saints. Let the dog bark, where my love is today.“ This fortune telling also involved family members. People would place candles in walnut shells and put these “boats” on the water. By what the boat did on the water, or whether the candle would go out or reach the shore, people could see their destiny. Pouring hot lead in water, a person’s future could be foretold for the coming year by the shape the lead would create. If a cross is revealed in the middle of an apple it means illness or death, while a star brings good luck and wealth. People to this day split apples in half for this reason. Leftovers from Christmas dinner were buried in the ground and under trees as a sacrifice. Livestock received special treatment too – cows got bread with parsley, rose-hips and butter, so as to have enough milk in the coming year. The farmer would knock on his beehive, so the bees would survive the winter. Poultry – hens would get a mixture of grain, peas and barley to lay more eggs. Roosters and ganders were given garlic to make them brave and healthy. In the morning people would wash in the river or their well to be healthy throughout the year. Burning incense in churches and frankincense at homes were purgative rituals. These are just a selection of customs and superstitions. Christmas and Easter are two of the main holidays in the Christian year. They are based on the biblical story of the birth of our Savior Jesus Christ. 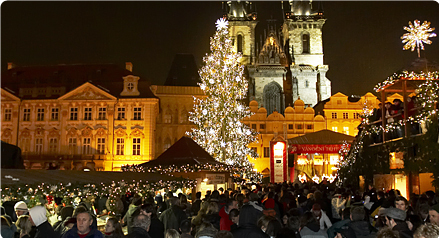 The Czech name for Christmas – Vánoce – indicates a number of holy nights (noc = night). Today however, only three days are widely known – Christmas Eve (December 24), The Nativity of Our Lord Jesus Christ (December 25) and St. Stephen’s Day (December 26). The 25th and 26th of December are holidays which are marked by families visiting each other, family lunches and dinners. Usually the traditional Czech roasted goose, duck or turkey with sauerkraut and dumplings is served. People also visit churches where nativity scenes are displayed. These scenes originated from medieval paintings depicting the birth of baby Jesus. Thus, the mourning of Jesus Christ was replaced by the celebration of his birth. The first creator of a nativity scene is thought to be the Italian sculptor Quido Mazzoni in the 15th century. His nativity scenes were made out of clay. The oldest mention of an exhibited nativity scene in the Czech lands is from 1562. Although they were initially displayed in churches, nativity scenes gradually spread into the homes of people and villages as well. Folk creators of nativity scenes placed the scene of baby Jesus’ birth into the environment which surrounded their villages. They depicted reality and combined it with their ideas of exotic lands, animals and clothing. There are many types and sizes of nativity scenes, generally two groups: Box-type small scenes were stored in the attic and brought down for the purposes of Christmas caroling. Nativity scenes with figures – had to be assembled every year, took a large part of a room and were rather large. Each year one or more new figures were added to the scene. There are also miniature nativity scenes inside bottles. The materials also varied – wax was not very popular amongst people, unlike mock-ups. These figures were made out of wooden skeletons with carved heads, legs and arms. Pieces of cloth or paper were then soaked in glue and attached to the skeletons and shaped into bodies and clothes. Wooden carved figures were decorated with polychrome. The town of Králíky is famous for the production of wooden nativity scenes – hence the name “the Kralice nativity scene”. Entire families would make figures about 2 – 15 cm tall. Every family member had a task – the carver would carve the bodies and the rest would then attach arms and decorations while helpers would color the finished figures with temperas or oil paints. The Králice figures were always similar even though they were made by different people. Another type is the 2D nativity scene. They were based on wooden board nativity scenes from the 18th century. Even today, this is a very common type which is available in many stores offering Christmas items. Baby Jesus, ox, donkey, Virgin Mary with Joseph, The Magi (Caspar, Melchior and Balthasar), shepherds and sheep, figures bringing gifts for baby Jesus: vánocka (Christmas bread), goose, flour, keg of beer…, musicians, angel with the inscription Gloria in excelsis Deo. The entire scene is topped with the star of Bethlehem flying across the night sky. Other figures can also be found, including hunters, chimney sweeps, millers, artisans, journeymen, farmers, farm helpers, pub keepers, night watchmen, goats, ducks, children. Simply the village in its entirety. There are numerous special Christmas events organized throughout the city. Exhibitions, concerts in churches and concert halls, advent music festivals, fund raisers, special programs for children – something for everybody. Czech Christmas cannot be complete without the Czech teacher and composer Jan Jakub Ryba’s (1765 – 1815) Christmas Mass with folk and pastoral elements Hey, Master. It is performed in churches throughout the advent season. Advent time is not only about exhibitions and concerts. People clean and decorate their houses before Christmas. Gifts for family and friends are purchased, Christmas and New Year’s cards are sent, Christmas bread and other Christmas pastries are baked (vanilla rolls, sugar cookies). Christmas trees are bought, typically spruces, firs or pines. Around December 20 big tubs with live carp for sale appear in the streets of town.